Polyhydroxyalkanoates are a promising family of polyesters for many tissue engineering applications. Unlike other synthetic biodegradable polymers, Polyhydroxyalkanotes are very favourable materials for Nerve tissue engineering, due to their slower degradation rates and lower acidity of degradation products. P(3HB) (Poly(3-hydroxybutyrate), is biocompatible, biodegradable and its properties can be tailored to its application. 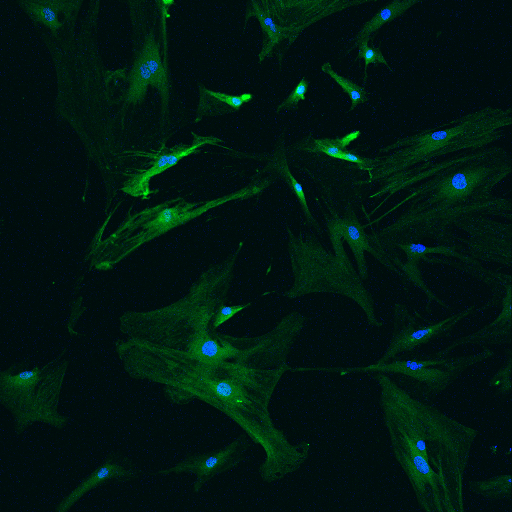 Rat primary Schwann cells were cultured onto P(3HB) films for 7 days and the cell nucleus labelled for Dapi (Blue) and the cell body labelled for S100 (green). During the regeneration process, Schwann cells elongate, and form the Bands of Büngner, to provide guidance cues and myelinate the regenerating axon.